BARCELONA, Spain (AP) — Spain’s confrontation with its independence-seeking region of Catalonia intensified Monday when a judge ordered the leaders of two pro-independence groups jailed while they are investigated on possible sedition charges for organizing demonstrations before the region’s disputed secession vote. The jailing of Jordi Sanchez and Jordi Cuixart, the heads of grassroots organizations Catalan National Assembly and Omnium Cultural, sparked an immediate outcry in Barcelona, Catalonia’s capital. People banged on pots and pans, honked car horns and clapped in the streets. The judge’s order came nearly 12 hours after a Monday morning deadline passed without the president of Catalonia clarifying whether he has declared independence from Spain. The Spanish government Catalan President Carles Puigdemont now has until Thursday to backtrack on any steps the region has taken toward secession. If he refuses, the government has said it would invoke constitutional authority to restrict or revoke the areas of self-governance Catalonia has now. 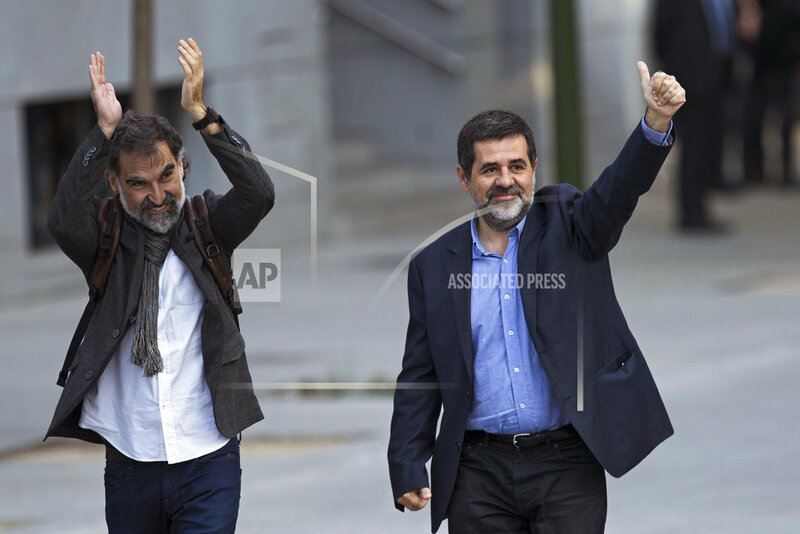 The judge ordered Sanchez and Cuixart jailed while their roles in organizing Sept. 20-21 demonstrations in Barcelona are investigated. Spanish police arrested several Catalan officials and raided offices on those two days to prevent an independence referendum from taking place on Oct. 1. In Monday’s court ruling, the Spanish National Court judge said Sanchez and Cuixart led the demonstrations, ignored some police recommendations for maintaining safety, and helped form a cordon to keep Spanish police from carrying out their duties, among other actions. If indicted, tried and convicted of sedition, they could face prison terms of up to 15 years. The actions of Catalonia’s police chief and a senior deputy during the September demonstrations also are being investigated. However, the judge ruled Monday that police chief Maj. Josep Lluis Trapero and Lt. Teresa Laplana, could remain free with restrictions, including revocation of their passports and orders to appear come back to court every two weeks. Earlier, Catalan President Carles Puigdemont and Spanish Prime Minister Mariano Rajoy exchanged letters but made no headway in the solving the region’s conflict, one of the deepest political crises the country has faced in the four decades since democracy was restored. Catalonia’s government held the Oct. 1 referendum over the Spanish government’s insistence the vote was illegal and a court suspending it so its constitutionality could be considered. Those who voted were overwhelmingly in favor of secession, but fewer than half of eligible voters cast ballots. Based on the referendum results, Puigdemont made an ambiguous declaration of independence last week, but said he would not immediately move to put it into effect to allow time for talks and mediation. Responding to the Spanish government’s demand to state explicitly by Monday morning whether he had declared independence, Puigdemont instead sent a four-page letter seeking two months of negotiations and mediation. The conservative prime minister, in a response less than two hours later, lamented that Puigdemont declined to answer the question and said he had until Thursday morning to fall in line. “To extend this situation of uncertainty is only favoring those who are trying to destroy civic concord and impose a radical and impoverishing project in Catalonia,” Rajoy wrote in his letter. “They try to imprison ideas but they make stronger the need for freedom” he tweeted. Catalonia is home to 7.5 million people and contributes a fifth of Spain’s 1.1 trillion-euro ($1.3 trillion) economy. Polls have shown about half of the people in the wealthy region don’t want to break away from Spain. The Spanish government is lowering the country’s economic growth forecast for 2018 from 2.6 to 2.3 percent, blaming the political uncertainty in Catalonia for the slowdown. The more modest growth target appears in the budget plan that Spain’s conservative government has submitted to European authorities. It was shared with The Associated Press early Tuesday. Tags: barcelona, catalan, court, judge decision. Bookmark the permalink.